This is a fun way to use up small pieces of paper strips. The ones I used in this card all all the same but you could easily make them random pieces. Fold Very Vanilla 4 ¼’ x 11” Cardstock in half to create card base. 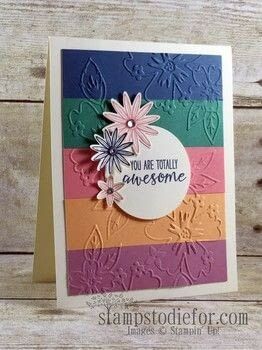 Glue the 1” strips of cardstock to the 5” x 3 ¾” Very Vanilla Cardstock and emboss this piece with the Big Shot & the Floral Affection Embossing folder randomly several times to cover the entire piece. Adhere the embossed piece to the front of the card. Stamp a Sentiment in Dapper Denim Ink on the 3” x 3” piece of Very Vanilla Cardstock and punch out with a 2” circle and adhere to the center of the card front with dimensionals. Stamp the 3 flowers Once with Flirty Flamingo and once with Dapper Denim 4” x 3 ½” Very Vanilla cardstock and punch out with Blossom Bunch Punch. Adhere the large Flirty Flamingo flower with a glue dot towards the upper left hand side of the circle and the middle size Dapper Denim flower below it and the smallest Flirty Flamingo below the Dapper Denim. Add Rhinestones to the center of the flowers.